What textural attributes must come together in order to give the consumer the perception of an “indulgent” yogurt? It can be difficult to describe this desired texture in a way that can be easily understood and acted upon by a formulator. For a situation like this, our Gum Gurus use our Food Texture Terminology to identify the textural attributes that are most important for the application and then use these attributes as a guide while formulating the new product. Certain mixtures of gums are known to synergistically gel, meaning that the different chain polymers link together in a way that makes the gel stronger than would have been possible if only one individual gum was used. The optimum gel mixture is reliant on the ratios of the component gels. Whether the goal is to improve texture, reduce syneresis or both, the Gum Gurus have already invested the time to find the combinations of hydrocolloids to provide the desired functionality. These hydrocolloid systems can be incorporated at different usage levels in order to meet desired formulation requirements. Some systems, depending upon the usage level, can make the same yogurt base into either a spoonable or a drinkable yogurt. Stirred & Cup-Set Yogurts: Dairyblend YG AG is useful for most vat-set (stirred) and cup-set yogurts and adds body and an overall indulgent texture to the product. TICorganic Dairyblend YG Smooth can provide a full mouthfeel to stirred yogurt applications. Drinkable Yogurt: Dairyblend Acidified Beverage 120 was developed to help stabilize the protein with minimal impact on viscosity in low pH ready to drink dairy beverages. TICorganic Dairyblend YG Smooth is organic compliant option that does well in smoothie-type applications. When a yogurt contains a fruit preparation it is first important to stabilize and prevent syneresis of the fruit preparations. For this purpose we recommend Caragum 300 2473. With fruit preparations, another focus lies on protecting the milk protein from the acidity of the fruit mixture. Ticaloid® 780 can fulfill this purpose, as it reacts uniquely with dairy, while increasing viscosity and mouth coating. Recently, carrageenan has been known to have a negative perception with consumers and is generally not seen as “clean label friendly”. However, due to its synergistic interaction with dairy proteins, carrageenan provides unique functionality in yogurt applications and a combination of hydrocolloids is often required to replace the multiple functionalities of this single ingredient. Our Gum Gurus can help you select a stabilizer that meets your texture, stability, and labeling goals. 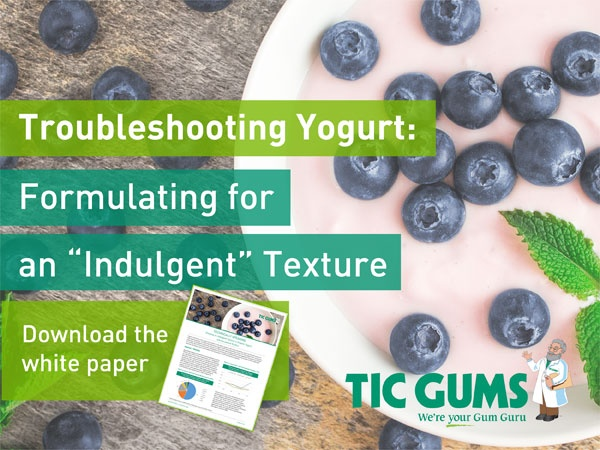 The white paper titled "Creating an Indulgent Texture in Organic Yogurt" to learn how we identified the key texture attributes of indulgent yogurt and selected a stabilizer that modified those attributes.